Codling Moth (CM) -- 1st generation, first sustained trap catch biofix date: May 18, Wednesday. Codling moth development as of June 14: 1st generation adult emergence at 80% and 1st generation egg hatch at 30%. In most orchards, insecticide targetted against plum curculio and apple maggot prevent codling moth damage. If targetted codling moth control is needed, key management dates are: 1st generation 3% CM egg hatch: June 3, Friday = target date for first spray where multiple sprays needed to control 1st generation CM. 1st generation 20% CM egg hatch: June 10, Friday = target date where one spray needed to control 1st generation CM. Obliquebanded Leafroller (OBLR) -- 1st generation OBLR flight begins around; June 4, Saturday. Where waiting to sample late instar OBLR larvae is not an option (i.e., where OBLR is known to be a problem, and will be managed with an insecticide against young larvae): Early egg hatch and optimum date for initial application of B.t, Delegate, Proclaim, Intrepic, Rimon, Altacor, Belt, pyrethroid or other insecticide effective against OBLR (with follow-up applications as needed): June 21, Tuesday. Where waiting to sample late instar OBLR larvae to determine need for treatment is an option, or to check on results from earlier sprays: Optimum sample date for late instar summer generation OBLR larvae: June 30, Thursday If first OBLR late instar larvae sample is below threshold, date for confirmation follow-up: July 4, Monday. Oriental Fruit Moth OFM -- 1st generation OFM flight starts: April 23, Saturday. 1st generation 55% egg hatch and first treatment date, if needed: May 27, Friday. 2nd generation OFM flight begins around: June 26, Sunday. Plum Curculio (PC) -- Increased risk of PC damage as McIntosh and similar varieties increase fruit size: May 22, Sunday. Earliest safe date for last PC insecticide spray: May 24, Tuesday. If relying on repellance by Surround instead of PC mortality by insecticide, Surround coverage should be maintained until PC egglaying begins to naturally decline around Friday, June 24. Redbanded leafroller (RBLR) -- 2nd RBLR flight begins around June 26, Sunday. Peak catch and approximate start of egg hatch: July 10. San Jose Scale (SJS) -- First adult SJS caught on trap: May 20, Friday. 1st generation SJS crawlers appear: June 16, Thursday. Spotted Tentiform Leafminer STLM -- 2nd STLM flight begins around: June 14, Tuesday. Rough guess of when 2nd generation sap-feeding mines begin showing: July 3, Sunday. NEW: Apple Bud Freeze Mortality Estimates -- Date: Wednesday, April 6, Estimated Potential Bud Freeze, 44%; Date: Tuesday, April 5, Estimated Potential Bud Freeze, 39%; Cumulative potential bud freeze: 66%. Preliminary McIntosh Harvest Date Forecasts -- Date to apply ReTain to delay first harvest for apples which without treatment would be ready for storage harvest on September 3 is from Saturday August 6 to August 13. Date to apply ReTain to delay maturity for 2nd, 3rd or 4th pick of those apples, without delaying start of harvest maturity, is from Sunday, August 20 to August 27. Begin measuring actual McIntosh starch-iodine index no later than Wednesday, August 17. The Michigan formula estimates that non-spur McIntosh will reach starch index 4.0 and start the optimum harvest window for long term storage on Saturday, September 3. Using the Champlain Valley NY formula, McIntosh maturity is forecast to reach starch index 6.0 in Belchertown MA on Wednesday, September 14. 15-June, 2016 (Wednesday). Orchard, Berry & Grape Field Day, Belltown Hill Orchards, 483 Matson Hill Rd., Glastonbury, CT. 2 PM to 8 PM. No cost to attend, dinner at 6 PM. Sponsored by CT Pomological Society, UConn Extension, CT Dept. of Agriculuture, and USDA Risk Management Agency. Field Day flyer. 13-July, 2016 (Wednesday). Massachusetts Fruit Growers' Association Summer Meeting, UMass Cold Spring Orchard, 391 Sabin Street, Belchertown, MA. Details TBA. Not much to say here, all is said below. Please read. But, I do hope to see you at the Orchard, Berry & Grape Field Day in CT tomorrow (June 15). And oh yea, Happy Flag Day. • Please watch the YouTube video on borer management. Please. • A new publication: Integrated Pest Management for Brown Marmorated Stink Bug in Orchard Crops. Authored by the BMSB SCRI CAP Orchard Crop Commodity Team. • Start scouting new plantings for potato leafhopper (PLH) the next time we get a strong southerly wind flow. PLH in young apple trees warrants immediate treatment with an insecticide (consult NETFMG for options) so they don't stunt new growth. • Obliquebanded leafroller (OBLR) pheromone trap catch/biofix established in last week at UMass Orchard. Treatment (Altacor, Delegate, among others, see NETFMG) according to the degree day model could begin as early as the middle of next week through the last week in June. • Pear psylla summer generation treatment timing is NOW. Control options are numerous, best bet is to read the recent and most excellent Jentsch Lab post dated June 13, 2016. Don't overlook this treatment window if you have had pear psylla problems in the past. • Codling moth (CM) eggs are hatching now which coincides with treatment timing if you have a problem with codling moth. 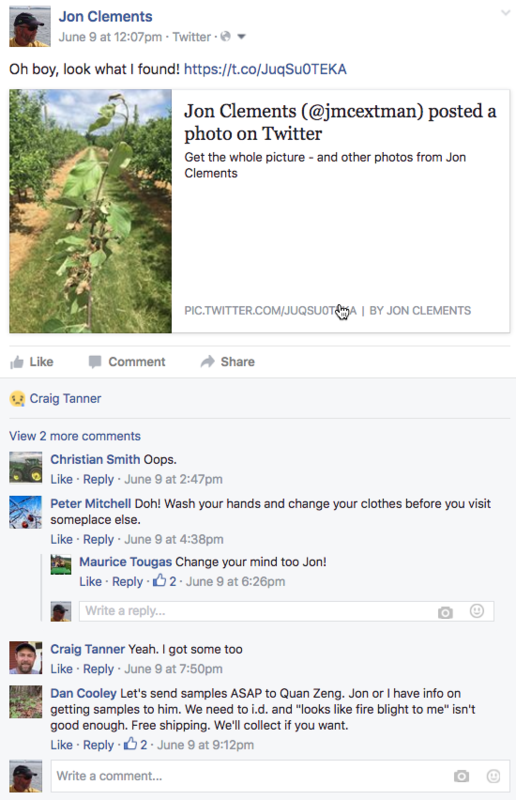 Some orchards do, some orchards don't. If you do, you probably know who you are and should be treating this week. Again, consult the NETFMG for treatment options at this timing. • Fire blight strikes are popping up, including here at the UMass Orchard. If you find fire blight, we would like to know about it, and possibly have tested for resistance to streptomycin. Give me a call (413-478-7219) or e-mail. • Otherwise, dry weather is not particularly conducive to any other disease problems. Take a break. Irrigation. It is abnormally dry. 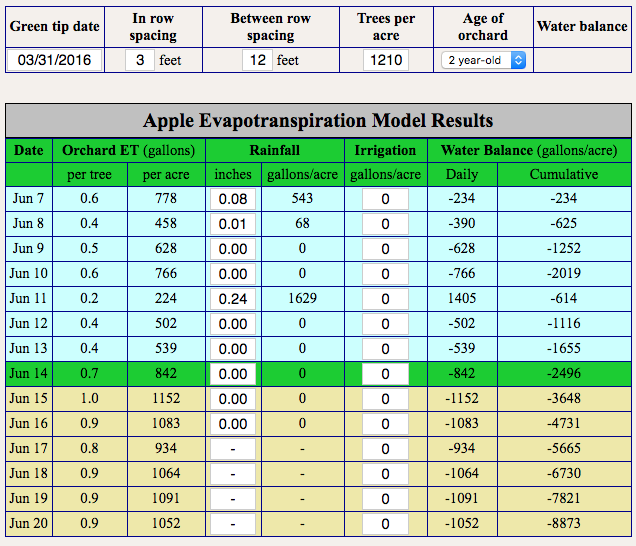 Have you looked at the NEWA Apple Irrigation Model? In it's simplest form, see below, I think it says my 2-year-old tall spindle planting trees are using 0.7 gallons of water today. Thus, if I have trickle irrigation at 3 feet spacing with emitter putting out 0.6 gallons of water per hour, I would need to run it today just over one hour to supply the trees water needs today. BUT, it says I have a deficit of -2496 gallons of water per acre -- therefore, I would need to run the trickle for app. 4 hours (4 hours times 1210 emitters at 0.6 gph) to get 2,904 gallons water per acre. I have an inquiry into Cornell for further clarification on interpretation. But, until then, don't underestimate your trees need for water. If you can't water, well your trees are not growing (unless it rains). Given the number of borer problems we see, mandatory watch please! The next Healthy Fruit will be published on Tuesday, June 21 (or thereabouts), 2016. As always feel free to get in touch with any member of the UMass Fruit Team (http://extension.umass.edu/fruitadvisor/team-members) if you have questions or comments.